The genesis of En Saga, originally premiered in 1892, is also shrouded in mystery, and even later in life Sibelius was reluctant to go into any detail regarding its content. It is among Sibelius’ earliest orchestral works, and its original title in Swedish, En saga, refers to ancient Nordic tales of heroes and gods. Although En saga is among the most popular works by Sibelius today, the premiere of the work was not a success and Sibelius revised the score in 1902. On the occasion of the 150th anniversary of Sibelius’s birth in 2015 composer Aulis Sallinen (b. 1935) orchestrated a cycle of songs for mezzosoprano Anne Sophie von Otter. This cycle of eight songs contains several less known songs in a cavalcade juxtaposing human emotions and innermost thoughts with the natural environment and experiences in nature. 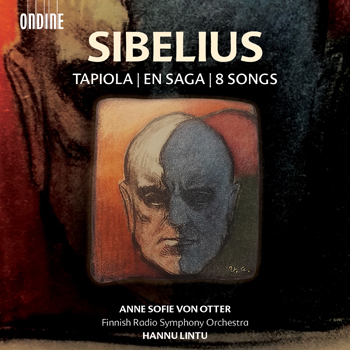 The recent recordings by the Finnish Radio Symphony Orchestra under Hannu Lintu on Ondine have gathered excellent reviews in the international press.